When we launched INTO THE FIRE, the first book in the Hot Nights series, I offered up a blog tour prize: a reader could name a dish that would go into MAKE ME, TAKE ME. Karen McDonald thought blackened chicken sounded good, so here it is! It’s juicy, spicy, herb-y, and got the thumbs up from two of my three kids. One caveat: to truly blacken it, you have to heat your pan to the smoking point, and that will likely fill your house with smoke once you add the chicken. If you have a lip on your pan, it might set the sticks on fire at the point of contact, too. If you have an exhaust hood, this won’t be a problem, but if you don’t, I recommend just cooking the chicken with the seasoning on it. Or grilling it outside. It will still be delicious, and you won’t have to open the doors and windows to get rid of the smoke! 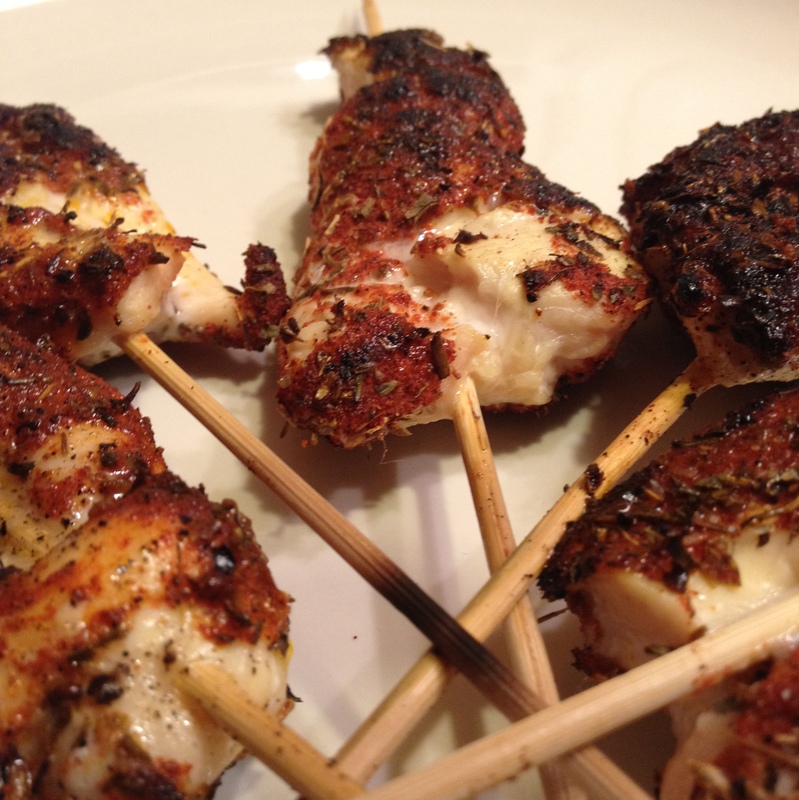 Cut chicken breasts into strips: about 1/3 inch thick, about an inch wide and about three inches long. As you cut them, lay them on a cutting board, cover them with a sheet of plastic wrap, and gently bounce a hammer up and down on them until they are slightly flattened. (Yes, you can just hammer each breast before you cut it, instead.) Toss the strips into a big bowl. When all the chicken is cut and pounded, combine chicken strips with as much Cajun Spice as you desire. Then thread the chicken onto the end of a bamboo skewer, knitting the skewer through the chicken. Put a little oil in a flat pan and heat it to the smoke point (or heat up the grill). Sear the chicken on each side, and then put the pan in the oven until the chicken is 165 degrees. It’s delicious just as it is, but my husband remarked that it would be REALLY good with remoulade sauce. Next time!